1) Tell us about yourself. Where are you from? What are you majoring in? Do you have brothers or sisters? What are you involved in on campus? I’m from Ozark, Missouri but I’ve lived in Springfield now for two years, and it’s always felt more like home. I have a younger sister named Lauren, and she has always been my best friend. My mother remarried in 2016 so I gained a stepsister and stepbrother. My major is exercise and movement science to pursue graduate school at Missouri State in the occupational therapy program. As of now I am involved in Bear POWER as a lead ambassador; however, I am also trying to become a member of the pre-occupational therapy club. 2) Tell us about being a Bear Power mentor. What are your responsibilities? How did you get involved in this program and become a Bear Power mentor? What training did you go through? As an Ambassador/mentor, my responsibility is to spend time with the Bear POWER students and provide a sense of support and familiarity. Each Bear POWER student has an ambassador that is responsible for working in an area of either academics, social, and health/wellness. To be an ambassador, it is encouraged that I spend two to three hours a week with the student I am paired with and during this time, we tend to focus on learning skills necessary for independent living. As an ambassador leader, I can cover tasks in areas of academia, social skills, and health and wellness while also ensuring the other ambassadors in the group are having regular meetings with our Bear POWER student. I can confidently say; my responsibilities feel more like a privilege. Every interaction I have with an individual in the Bear POWER program furthers my enthusiasm for this important addition to Missouri State. I happened upon this program by setting up a meeting with Rachel Heinz and we discussed the program and what it would look like to be involved as an Ambassador. Ever since I met Rachel and saw her enthusiasm for Bear POWER and how hard she worked to get it put in action, I knew this is where I am supposed to be. I attended a few of their fall events like a Halloween Party and a movie night and I fell in love with the atmosphere of the group. Everyone was so welcoming and kind—it truly felt like a homecoming. Towards the end of the fall 2018 semester, I signed up for a training hosted by Rachel Heinz and the Arc of the Ozarks. In this presentation, faculty and staff of Bear POWER and the Arc discussed expectations for ambassadors, gave advice and guidance for interactions with the students and resources to utilize in the community during times of stress, and finished with scenarios that the average college student will face and how to address those challenges. 3) Why is the Bear Power program important to the students involved? The Bear POWER program is important to the students and ambassadors alike. It’s an amazing opportunity to encourage such a necessary element in universities across the nation one school at a time. 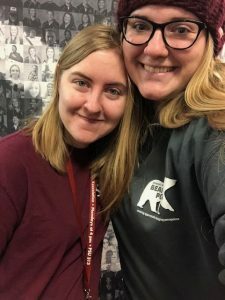 Inclusion is an aspect of college that Missouri State values and Bear POWER brings students seeking the chance to embrace and spread this even more. As an ambassador executive members stated, and everyone completely agrees, “we are part of something much bigger than ourselves.” This program is in place for not only our experience at Missouri State, but future Bears as well. All students involved are here to pave the way for equal opportunity for students of all abilities from this point on. 4) How is working with the Bear Power participants changed you? The faculty, staff, students, and ambassadors in Bear POWER have influenced my life in the most positive ways. The opportunity to be part of such an amazing group has helped me develop as a leader and member of the Missouri State community. The support and teamwork provided from every individual in the Bear POWER program is truly inspirational. Bear POWER further fueled my passion for inclusion and finding strength and beauty in all abilities. 5) What is your favorite Missouri State tradition? Why? My favorite MSU tradition is Fountain Day because the fountain is so beautiful, and it gives me that extra boost to make it through to the end of the semester. 6) What is the last movie you saw, and would you recommend it? Why are why not? The last movie I watched was The Shawshank Redemption, and I absolutely recommend it. This movie is so emotionally befuddling; I experience feelings of pure joy, frustration, sadness, and excitement in the span of 30 minutes throughout the entire film and I always end the movie feeling a different emotion each time it’s over.